HAHAHAHA! PIKACHU IS DA BEST! I saw the new one and both are great in their own respect!! i really like the texture you used in here gorgeous pic! Hahaha, I'm glad everyone like it ! xD !! 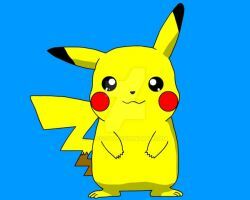 I AM FULL OF PIKACHU AND I AM COMMING FOR YOU!! PIKACHU AND ME GOING TO BEAT YOUR ARSE!! also congrats on getiing a daily deviation on this! I found 21 Pikachu. maybe a Missed some...Let me know! creepy Pikachu in the art but it is awesome!!!! So many pikachus *0* !! The more pika, the better!